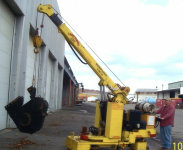 T. Bruce Campbell offers a comprehensive selection of Cranes, Forklifts, Manlift, & Specialty Lifting Equipment. Cranes from a 15000 Lbs. walk behind crane that will go through a 42" mandoor to a 225 Ton all terrain crane with a lifting height of 325'. T. Bruce Campbell can service your lifting needs.